Just how Irish is the Democratic vice-presidential nominee? And what does Tim Kaine’s family tree have in common with Downtown Abbey? No sooner had Hillary Clinton announced Tim Kaine as her running mate than articles on his roots began to appear – mostly about his inherent Irishness. There’s good reason for this, as he is of mostly Irish heritage – about 80 percent, with the balance being Scottish. And he’s been to Ireland a few times, even visiting the homestead of his Farrell line in County Longford. But what else was there to learn? I went digging and discovered striking parallels with Vice President Biden’s family history. Both are predominantly Irish (Biden coming in at roughly 63 percent), with maternal family trees that are entirely so and paternal ones that are slightly more mixed. Both families are also devoutly Catholic. I tripped across a number of references to Kaine’s ancestors as being among the earliest and/or longest parishioners of assorted Catholic churches, and at least two branches produced priests, including one who resides in Wichita today. 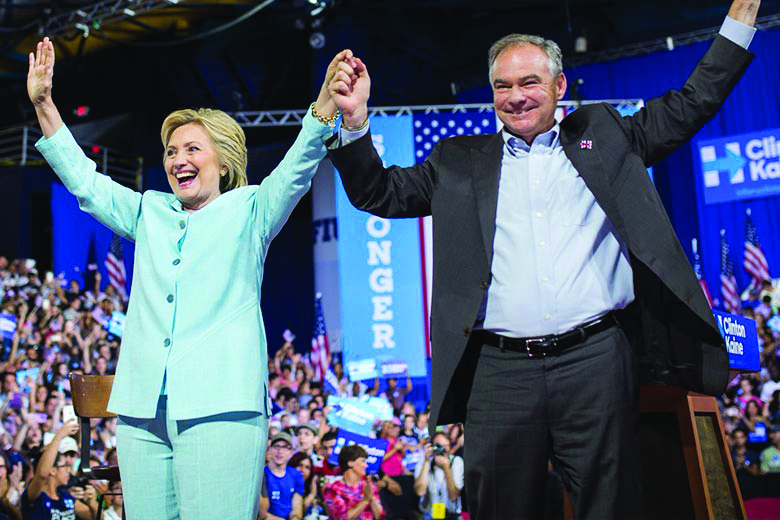 Both are descendants of mostly Famine-era emigrants – though in Kaine’s case, it was his surname line that would bring up the rear when his Kaine great-grandfather arrived in the 1880s. In fact, on his father’s side of the family, all his great-grandparents were immigrants, while on his mother’s side, all his great-great-grandparents were immigrants. Surnames that appear in Kaine’s family tree include Buntin, Burns, Downey, Farrell, Finn, Fleming, Flynn, Gormley, Hanighan, Hannon, Hermiston, Jones, Kaine, King, Mackey, Mannion, McAnally, Milnamow, Phelan, Potts, and Sullivan, so particularly if yours overlap geography-wise, you could be cousins. And the geography in play? In the United States, it’s mostly Kansas and Missouri, with supporting roles played by Illinois and Iowa and a sprinkling of other states. Once you cross the pond to Ireland, he has roots in at least Cork (Wallstown/Castletownroche), Dublin, Galway, Kilkenny (Mullinakill, Tullogher), and Longford (Derryad, Killashee). In Scotland, it’s the vicinity of Glasgow that holds his past, my favorite being the charmingly-named Paisley. And while there are additional locations to be determined in Ireland, some of what has been claimed is either wrong (e.g. Donegal) or unsubstantiated (e.g. Waterford). So preliminaries aside, what’s his family’s story? Bennett house where the Kaines married. Many who delve into their roots fixate on ancestors who bore their surname. I’ve been known to bristle at this kind of genealogical myopia, but have to admit that in this instance, it was the Kaine branch that captured my attention – mainly because I saw in their lives a sort of American Downton Abbey. But, to be clear, they were the downstairs people. Alexander Kaine was born in Campsie, Scotland in 1863 to an Irish father and Scottish mother. 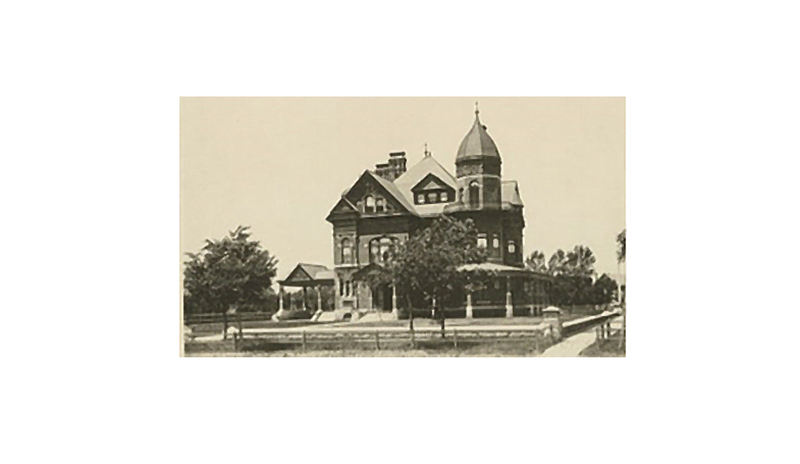 He emigrated to America as a young man in his twenties and found his way to Topeka, Kansas where he went to work for Erasmus Bennett, a wealthy horse importer and breeder. But he was more than just another employee. Apparently, Alexander had a way with horses, so became Bennett’s foreman. You wouldn’t think that stable master for a rich fellow in Topeka would be an especially dangerous job, but it was. In 1890, Alexander was attacked – and viciously so – by a fellow who worked for him. If you’re interested in the gory details, I invite you to read the article to the left. For those who’d prefer to skip, suffice it to say that you can do a lot of damage with a pitchfork. And this wasn’t just any ordinary house that hosted the Kaine wedding. So grand was it by the standards of the day that when Erasmus Bennett later fell on hard times, he sold it to the state of Kansas to be used as the governor’s mansion, a role it served until 1962. So Alexander and Isabelle, it seems, were the Carson and Mrs. Hughes of Topeka. 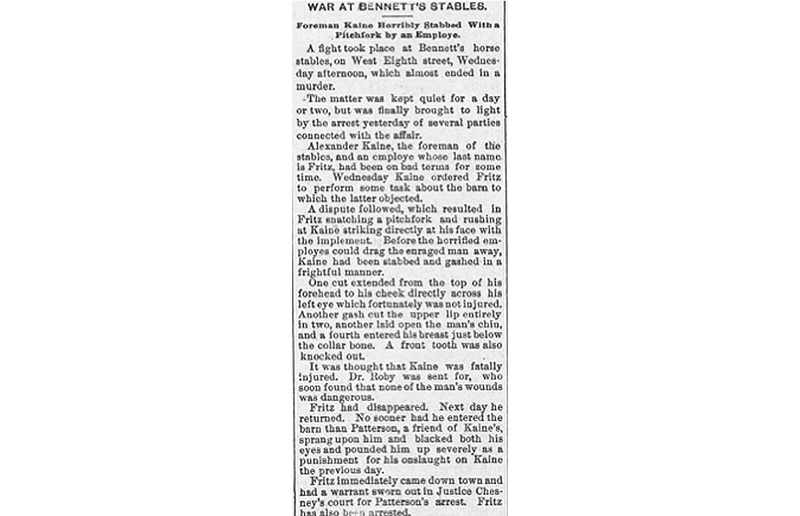 Even after they moved on from the Bennett family, Alexander retained his interest in horses as can be seen from a 1910 record of Mongolien, a Percheron draft horse he owned. All in all, not a bad start for an immigrant couple, but there was a bit more to the Kaine family tale. Alexander had a brother named Hugh who also came to Kansas where he worked as a blacksmith, but his story took a different turn. He also married a woman from Scotland and had four children, but in 1901, he died. His widow, perhaps overwhelmed at the prospect of raising her family in a foreign country, went back to Scotland. Life doesn’t seem to have been much easier there, though, as she worked as a charwoman to support her brood. But as most families do, they muddled through, so that one outcome of this peculiar detour is that Tim Kaine now has Scottish cousins with Kansas heritage via his unfortunate great-granduncle Hugh. Perhaps one day, he’ll have the opportunity to introduce them to their shared Pottawatomie County roots just as the Irish welcomed his family to their ancestral town of Killashee. One of Kaine’s grandmothers had a mishap as a youngster where she accidentally cut off part of her thumb. This child’s father was involved in local Democratic politics, and wanted to be sure that everyone knew that he had “no blood relations who ever voted another ticket,” perhaps insinuating that he had some uncooperative in-laws (to the right). Galway-born John Mannion, a great-great-grandfather of Tim Kaine’s, was one of the first Catholics in this part of Kansas. According to a retrospective, “In August, 1870, the first Catholic services in Butler county, were held in a little log cabin on the farm of John Mannion, who had settled here three years previous.” He lived long enough to celebrate his 50th anniversary in this same place. Despite claims that he was born in Donegal, Kaine’s immigrant Hannon ancestor was born in Carriganaltig (in the Wallstown/Castletownroche area) of County Cork, which seems appropriate since Tim Kaine enjoys spending time in Cork and has been dubbed an “honorary Cork man.” Turns out he’s an actual Cork man. This same ancestor arrived in New York on November 28, 1851 at the age of 11 on a ship called Florida. Given that there’s no one else called Hannon on the ship, it may be that the Jones listed two lines above him was his uncle, since his mother’s maiden name was Jones. This ship’s manifest includes a column for recording those who “died on the voyage.” Fortunately, only two of the 390 passengers on board died during this particular journey. Kaine’s immigrant Fleming ancestor was born in Mullinakill, Tullogher in County Kilkenny, and his family can be found there in the 1833 tithe applotment. This great-great-grandfather would take the most meandering journey of all of his forebears. Starting in Ireland, he went to Canada (Bruce County, Ontario), then Illinois, then back to Canada, then to Kansas, and finally to Oklahoma. Given the timing involved, the Fleming family and Downey branch they married into may well have been among the so-called “coffin ship” arrivals to Canada during the Irish Famine. RootsIreland.ie has future immigrants and great-great-grandparents, Patrick Farrell and Mary Malnimow, marrying in Killashee, County Longford on September 4, 1834, but for whatever reason, the actual record isn’t found in the parish collection housed by the National Library of Ireland. Still, it seems to be accurate as it meshes with a detail-packed, multi-generational, local history profile of Patrick. It’s also the place that Tim Kaine visited with his family in 2006 based on his parents’ visit to the same place years earlier. Locals are excited about their famous son, with people already joking about a Tim Kaine Plaza like the Barack Obama Plaza in Moneygall. As with his running mate, Hillary Clinton, there are a number of errors to be found in the assorted online trees for Tim Kaine. The most common are incorrect places of origin in Ireland and the most pronounced is in the Burns line where I failed to find a single tree that has the right parents for Tim Kaine’s great-grandfather, Michael F. Burns. While it’s less severe than the case of Clinton (everyone had one of her grandmothers wrong), it still translates into one-eighth of his family tree being off.